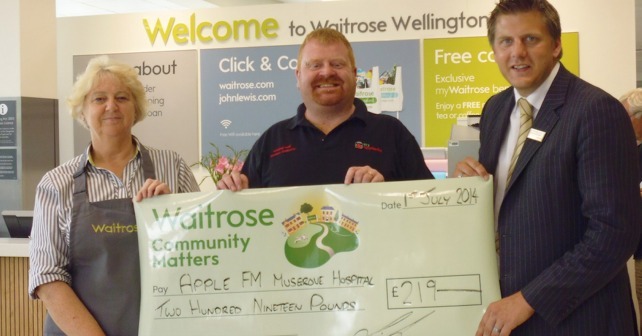 During the month of April, Waitrose in Wellington had Apple FM as one of it’s Community Matters projects. At the end of your shop in branch, you receive a token to place in a box of the good cause you’d most like to support. The more tokens a cause gets, the bigger the donation they receive. Each month every Waitrose branch donates £1,000 between 3 local good causes that you choose. We are very proud to say that Apple FM was the recipient of a cheque for £219 from the Wellington Branch. Presenting the cheque to Phil Hodgson is Waitrose Partner Lyn Harris & Store Manager Simon Spooner.